This is the experimental wind generator at the Jacksonville Center and the blades are rarely stationary. As I got out of my van yesterday morning, I saw that the blades were still for a change and there was a small bird perched on top of the highest blade. I dropped my gear and dug out my camera and managed to get just one shot before the blades started moving and the bird abandoned his perch. 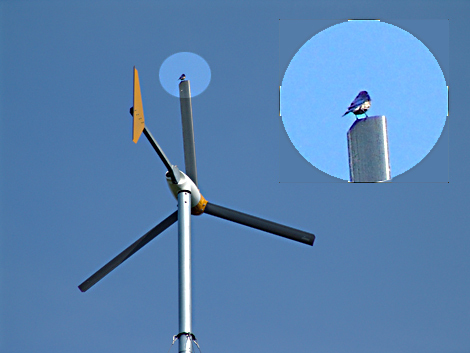 Wind generators and birds do not mix, as they have discovered in California. Here in Floyd, things seem to move at a more leisurely pace. For a brief moment however, this bird served as a metaphor for the "apparently successful" business executives who sit on top of the world oblivious to the instability of their perch. Hopefully they will be able to dismount as easily as this bluebird did. What is supporting you and how long will it last? Do you have a Plan B ready to execute when the wind changes? Classic quote, both success and failure are but brief moments in time, everything is always changing.